Valk Industries, Inc. excels in manufacturing custom thermoformed clamshells, face-on blisters, trays, fillers, structures, etc., to meet your requirements. Valk takes your completed product design or your basic concept and turns your project into reality. An array of thermoforming equipment is available to meet your requirements. Multiple machine sizes allow thermoforming of both large and small items. This broad range also allows us to select the proper mold size to suit your volume requirements and maximize cost efficiency. Thermoformable materials include PVC, APET (Virgin, Utility and RPET), PETG, HIPS, flocked HIPS, ABS, Acrylic, etc. 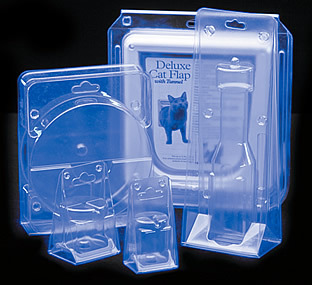 Additionally, many materials are available in clear and a range of colors upon request. Various software systems such as AutoCAD, ProEngineer and MasterCam are utilized in the design and tooling process. All thermoforming tooling is manufactured in-house by our experienced tooling department. This allows us to provide high quality custom tooling, while controlling cost and lead times. Contact us for more info on Custom Thermoforming.